May has been observed as National Physical Fitness and Sports Month since 1983. The observance was introduced through the President’s Council on Fitness to highlight the importance of pursuing a healthy lifestyle among Americans. National Physical Fitness and Sports Month was in the making for several decades prior to the eighties. President Eisenhower set the ball rolling with the launch of President’s Council on Youth Fitness in 1956. President Kennedy renamed it as President’s Council on Physical Fitness to cover people belonging to all age brackets. The President’s Council aims to remind Americans on a timely basis about the importance of maintaining good health to ensure longevity. How is National Physical Fitness and Sports Month observed? Every year, America observes National Physical Fitness and Sports Month through awareness events held by health departments, schools, colleges, healthcare providers and fitness clubs. Businesses have also realized the importance of associating their brand with this observance. 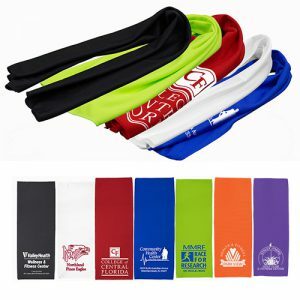 Many of our customers seek fitness-themed promotional products to highlight their brand. 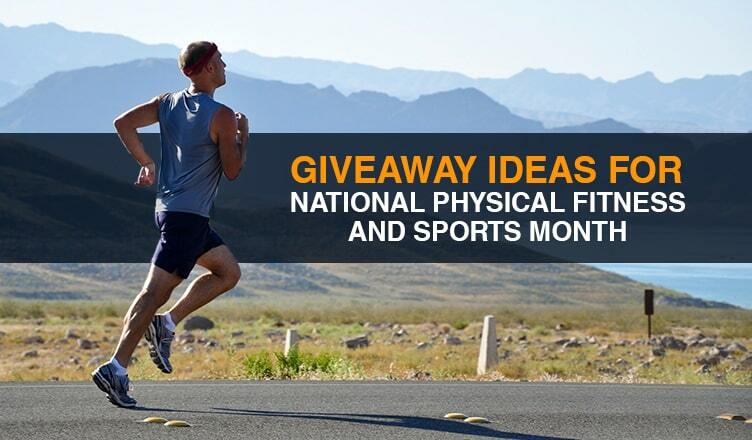 We have made things easier for you by listing desirable promotional items that should be considered for National Physical Fitness and Sports Month. 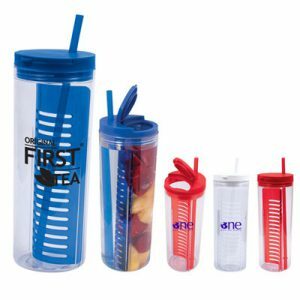 Infusion tumblers allow users to mix their favorite fruits with water to produce natural flavors in their beverages which can be very enjoyable after a hectic workout. This product has a large flap panel that allows fruit to be added and the lid can be unscrewed for inserting the fruit or washing. It’s dishwasher-safe and made of AS plastic. Place an order immediately! Other recommended fusion bottles include the 25 oz Flavor Mate Bottle, the 25 oz. Infusion Water Bottle, and the 23 oz. h2go Fusion Bottle. 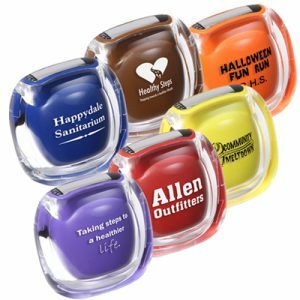 Other recommended pedometers include the Fitness First Pedometer, the Designer Top – View Pedometer, and the Round Step Pedometer. This product is compact and easy to carry around. It helps recipients pursue their strength training regimen wherever they are! Another highlight of this product is that it is available with our FREE 24 Hour Service, which means that it ships the next day after you place an order. 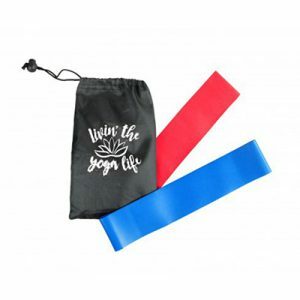 This fitness resistance band comes with two tension strengths as well as a storage bag for easy portability. The Exercise Resistance Bands Set is another recommended buy. This bag can be used to transport fitness essentials to the gym or club. Made of 60D Polyester, this spacious bag has a .8 mm vinyl storage pocket, durable mesh straps and comfortable handles. This bag offers a generous imprint area, allowing others to notice your brand’s credentials wherever this bag is taken! 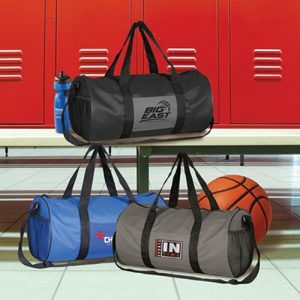 Other recommended duffle bags include the Sports Duffel Bag, The Sport Duffel, and the Kadin Sport Duffel Bag. This towel is 100% eco-friendly and free of chemicals. Featuring a microfiber polyester construction, this cooling towel can be made wet with water and wrung-out to activate. It has an exclusive air pocket construction that quickly absorbs and retains the water. The towel has moisture-wicking properties that ensure the user’s skin remains dry and comfortable. Other recommended cooling towels include the Eclipse Copper-Infused Cooling Towel, Chill-Out Cooling Towel & Bottle, and the Cooling Towel in Carabiner Case. Need more giveaway suggestions? Or maybe you need some marketing tips to ensure that your brand’s message is heard far and wide? Get in touch with us for any queries and we’ll gladly be of help!